Having set up an Argo based Grabber to support some QRSS tests I was soon keen to see what I could do with a relatively simple very low power transmitter, or Manned Experimental Propagation Transmitter (MEPT), and my W3DZZ inverted-V dipole. There are many designs / kits available on the Internet, I chose to build the Hans Summers QRPLabs latest Ultimate3. This is offered as a single-band kit of parts that will allow many different modes to be used and by purchasing additional plug-in LPF kits it’s possible to use the Ultimate3 on 12 different HF / MF bands. I placed an order on 29/11/2013 for a kit with 30M LPF plus one additional LPF for 10M. The ordering process was very straightforward and an email confirmation of my order was received later that day. Having placed my order I was naturally keen for the kit to arrive. On 12/12/2013 I received an email telling me that the kit had been shipped and finally on 18/12/2013 the package arrived! 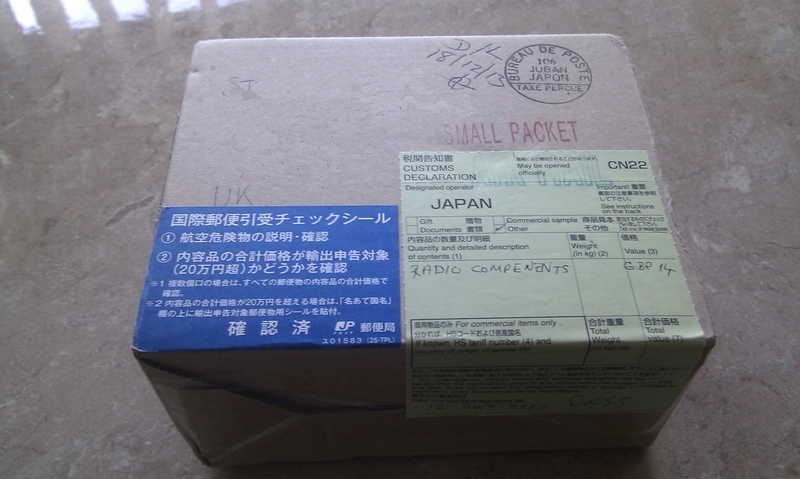 Much to my surprise the kit of parts was shipped from Japan. 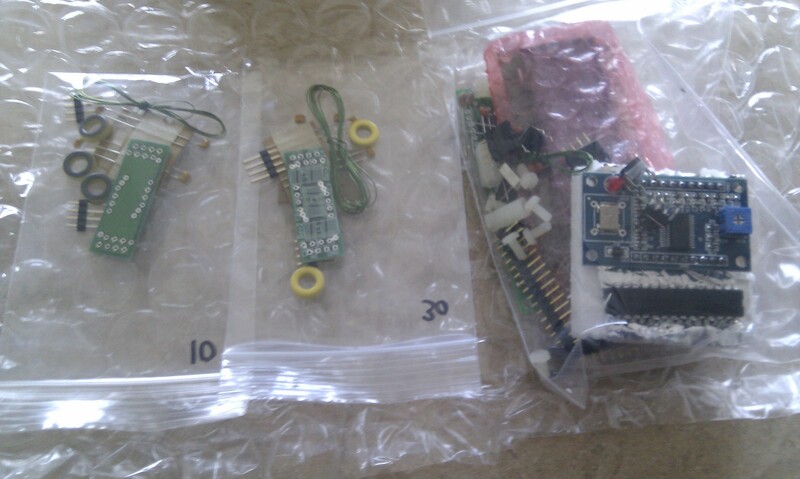 The kit was extremely well packed, and the various bags of components clearly labelled. Two LPF kits (for 10M and 30M) plus the Ultimate3 kit including DDS module. The Ultimate3 requires a 5V DC power supply. Being keen to get the unit going I decided to use an old “phone charger”-style PSU found in the junk box with a small outboard regulator to reduce the 7.5V output of the PSU down to 5V. Following the recommendations in the assembly instructions, I glued a fairly thick piece of copper to the DDS crystal housing to act as a heatsink and improve the frequency stability. Ultimate3 after configuration. Showing signs of instability. Here you can see that the signal strength was far too high for my receiver / Argo, even without an aerial connected to the receiver. 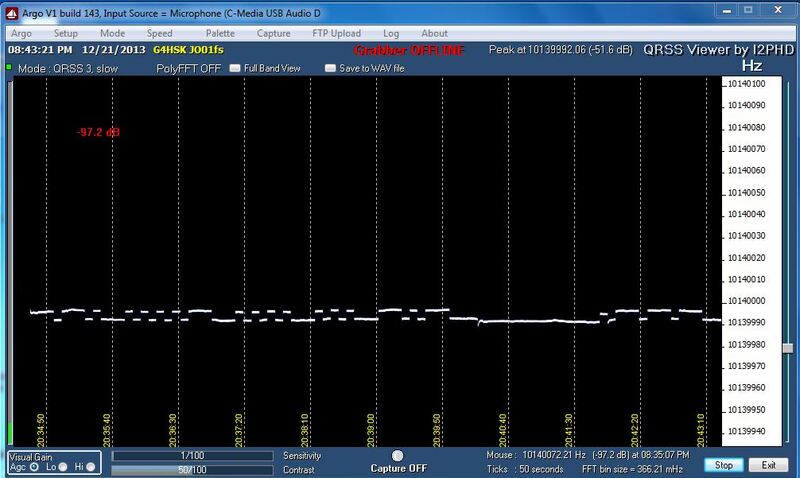 You can see that the frequency dropped by about 20 Hz from switch-on but settled very quickly. 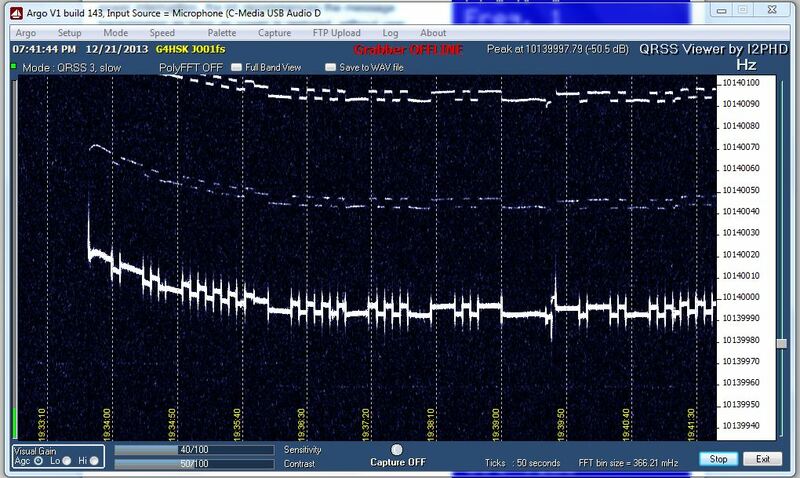 By reducing the Argo Sensitivity setting to 1/100 and reducing the RF gain on the receiver (FT-847) I got a much improved trace, but it still did not look that great. I suspected that the 5V supply was possibly the cause of this and applied some extra decoupling plus a large clip-on Ferrite. This made a slight improvement but you could still see some frequency instability at the start of some characters. I then remembered that I had an old 0 – 30V test lab-quality PSU squirrelled away somewhere. This is now back in service and has resolved the problems I was seeing. Ulimate3 running on Farnell PSU – much improved trace. The next stage was to box up the Ultimate3; here I used what has become the HSK standard project housing, an Eddystone die-cast box. The photo below shows the end result, albeit without the two push-to-make switches as my spares box let me down and they were not available at the time! Possibly the most difficult part of setting up the Ultimate3 was determining what frequency to use within the very narrow bandwidth used for QRSS transmissions. To do this I checked a number of Grabbers (both local and distant) at various times of the day and night (using their archives) to find a spot where there was the least chance of “sitting on top of” (or under!) another MEPT. Obviously there’s no guarantee of this, but by doing your homework you can reduce the chances of this happening. 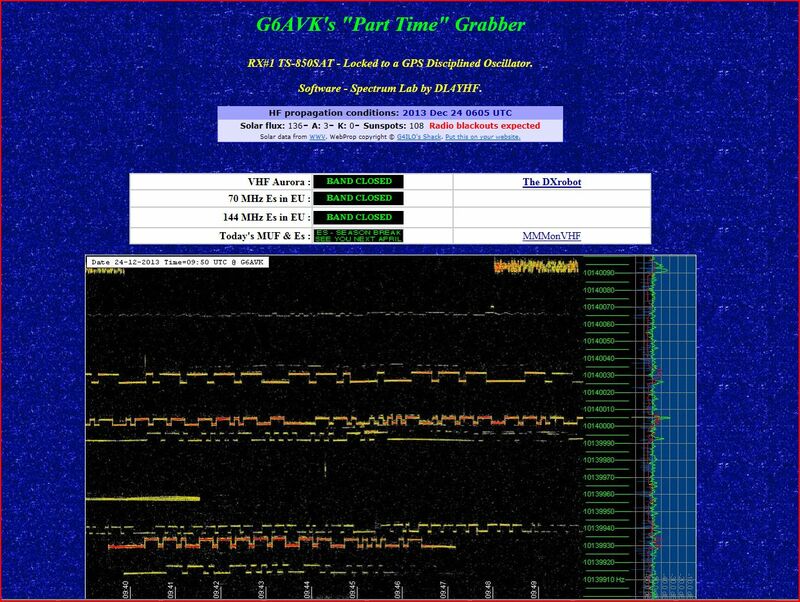 The images below shows a selection of captures taken over the first few days from various Grabbers active on 30m. After a very frustrating wait for the kit to arrive, I have to say that it was well worth the wait. I’ve had tremendous fun over the holidays putting it all together and seeing where my signal could be “captured”. If you do happen to see my callsign appear on your Grabber then please do let me know. Any reports would be much appreciated. 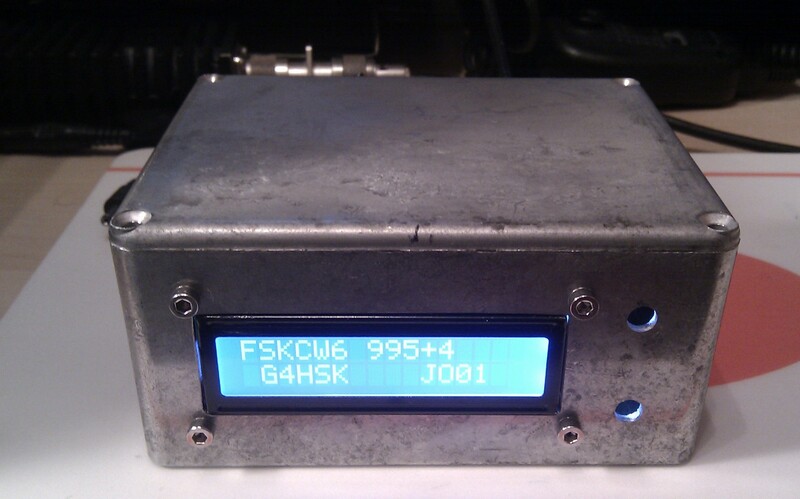 To complete the 10m LPF and run some tests on that band. Try the Ultimate3 with the 24″ bicycle Mag Loop. Add a GPS module to improve timing and stability. Install the switched LPF board when it’s available.